L/D Trains Get an Apparent Reprieve. If Amtrak’s top management really was plotting to dismantle the long-distance network, it would seem those plans have been put on hold. In a recent appearance before the House Transportation & Infrastructure Rail Subcommittee, Amtrak’s Chief Operating Officer, Scot Naparstek, acknowledged that Amtrak had a renewed focus on safety. However, he emphasized that no long-distance routes would be shut down on January 1st if their Positive Train Control system had not been installed by that date. More details are available on the RPA website. And on the subject of the Rail Passengers Association, our annual Fall meeting will take place around the middle of next month in Miami. I’ve just heard that two former Amtrak presidents will be speaking to our gathering: Joe Boardman in person and David Gunn by way of Skype. Boardman has publicly criticized the current Amtrak management and, while I’ve not seen or heard any comments from David Gunn, I must believe that he has some strong opinions on the course being taken by Richard Anderson and his colleagues. The most knowledgeable people I know, consider Gunn (r) to have been the most competent of all those who have run Amtrak over the years. 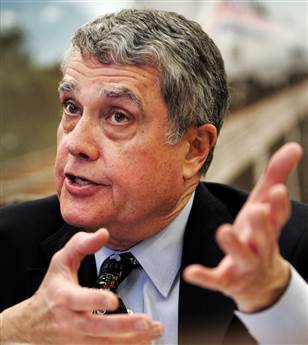 I’m not sure any of the real reasons for his sacking have ever come out, but Cliff Black, long-time head of Amtrak’s Corporate Communications office, told me at the time that the day David Gunn was fired was the worst day of his Amtrak career. Cliff was with Amtrak for more than 30 years. Incidentally, our gathering in Miami will include a tour of facilities and a ride to West Palm Beach and back on the new Brightline train. All in all—and pretty much as always—a lot to look forward to next month in Miami. Previous It’s Just Us Against the Storm. NextFive Photos from Five Train Rides. I wish David Gunn could have a hearing before Congress.